More doctors are turning to portable ultrasound devices, such as SonoSite's SonoHeart Elite, which weighs less than 6 pounds and runs on batteries. (CNN) -- The medical instrument that most symbolizes a doctor, the stethoscope, may be nearing its end as new technology makes the rounds in the medical field. Handheld ultrasound is the tool of choice for some doctors who think it's time to replace the stethoscope, which has seen little change since a French physician invented it in the early 1800s. "The stethoscope is based on sound, and the sound qualities don't always allow you to distinguish between a heart that is beating well, and one that isn't," says Dr. David Hellman of the Johns Hopkins Medical Institutions. "Sometimes the heart muscle is very weakened, but unless that weakening leads to extra sounds, you may not be able to pick it up." 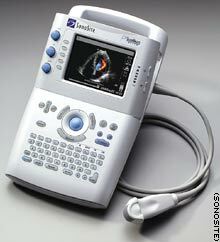 Handheld ultrasound devices allow doctors to actually see the heart working and see if there is a problem. Ultrasonic waves and their echoes produce images of organs and systems inside the body. The ultrasound procedure is commonly used during pregnancy to check on the health of the baby or in tests to measure blood flow through the heart. Ultrasound has generally been reserved for specialists, but as technology has improved, smaller handheld devices that produce good quality images are being developed. But the advance has some doctors concerned. "There's a specialty in ultrasound," says Dr. Michael Hill of the American College of Radiology. "It's a technical skill that's hard to learn to be good." Hill says he's worried that if untrained doctors use a tool like ultrasound, they will both misdiagnose and think they see problems where there aren't any. This could mean patients end up having unnecessary procedures. Hellman and his colleagues at Johns Hopkins are studying how much training is necessary for primary care doctors to use this equipment. "If it turns out that the average doctor with several months of training can learn to use this well, I think it will proliferate," Hellman says. And that could change a patient's general exam. "Is the heart big? Is there fluid around it? Do the valves leak? How well does the heart work? All these questions could be answered in the primary care physician's office with a handheld ultrasound," says Hellman. But better technology costs money. A regular heart ultrasound done by a specialist in a hospital can cost between $700 and $1,200. Experts say it's still unknown what a primary care physician might charge, but since the machines start at about $15,000, it will likely be more costly than an exam with a stethoscope.